After all data have been entered, as explained in the previous Chapters, the annual revenues have to be calculated for all properties / businesses (also called 'fee-fixing'). There are different ways to calculate the fees of all properties (3 ways) and of all businesses (2 ways). This is based on a fixed rate for each property use, which is defined by the Assembly for each 'property use' in GHc for each year. Data required are the classes and their 'rates' (imported or entered as explained in the previous Chapter 8.7.2.6) and the 'property use' code (usually a code such as 101, 102 or similar) of all properties (imported or entered with the 'Import revenue data' Tool as explained in Chapter 8.7.2.2). Again: Each property must have a 'property use' code (a code such as 101, 102 or similar). Example: Each residential property of class 1 (usually coded in LUPMIS as 101) is rated by the Assembly with GHc 15.00 per year. Property 678-0789-0012, which is in this class 101, has a revenue of GHc 15.00. This is based on the revenue income, as expected by the Assembly, and on the property value of each individual property, as assessed by the Land Valuation (Board). Data required are the total expected expenditure, the non-property revenue and the area of revenue expectation, which is either for the entire District (enter 'all') or only for a specific Sector (Local Plan, enter name of the Local Plan). Additional required data are the 'property use' code (usually a code such as 101, 102 or similar) of all properties (imported or entered with the 'Import revenue data' Tool as explained in Chapter 8.7.2.2), and the property values (in GHc) of all properties (imported with the same Tool). These two steps can be combined, if the property values are in the property data file. 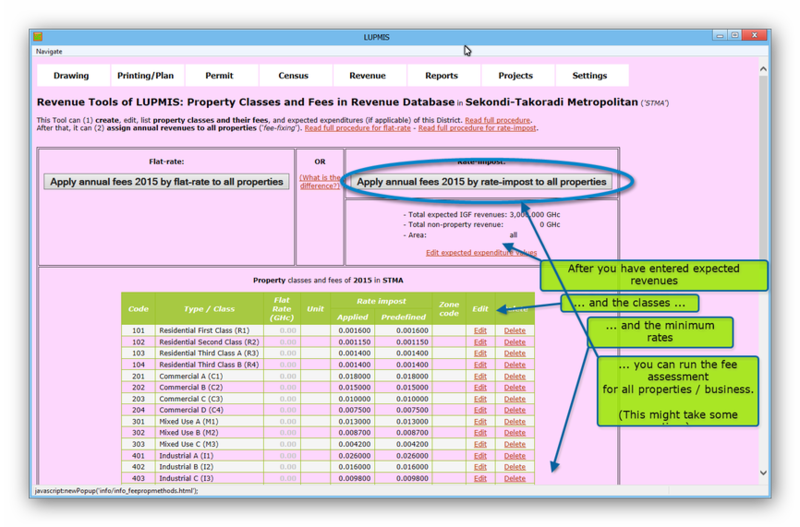 Technical note: LUPMIS will automatically calculate: First, division of the expected property revenue by the total of all property values to come up with the rate-impost factor for all properties. Then, for each property code (e.g. 101, 102 etc): Calculation of the total of all property values, multiplication of this total with the rate-impost for all (from previous step), and division by the property value of all properties. This will create an 'unmodified rate-impost factor' for each property code. As this will not add up to the requested total expected property revenue, it has to be modified in form of a multiplication factor. 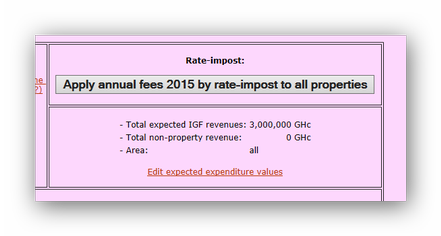 With this 'modified rate-impost factor' all property values will be multiplied to assign the final revenue. 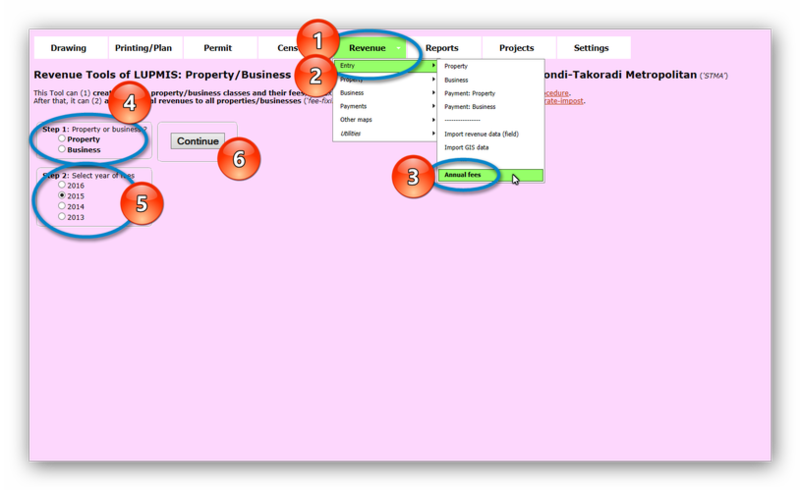 The rate-impost factor will be displayed for each property category. 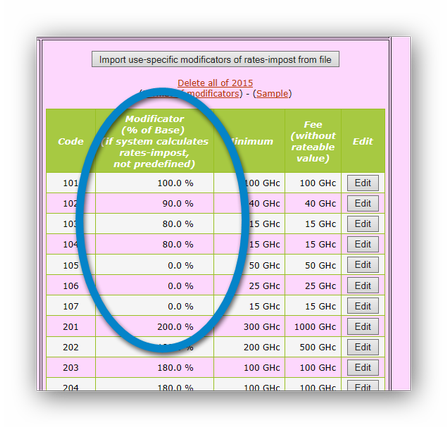 The system will use this factor ('modified rate-impost factor') for calculation of all properties. Example: The Assembly determines 8,000,000 GHc as the total expected expenditure, 3,000,000 GHc as the non-property revenue, for the entire District ('all'). Property 678-0789-0012 has property use 102 ('residential class B') and a value of 15,000 GHc. This results in a rate-impost factor of 0.000123 and - after multiplication with the value - in a revenue of 123 GHc. A technical description of the difference is accessible in the 'OR' column ('What is the difference?'). This is the well established method to calculate property fees and might be so over the next years. It is based on the rate-impost figures, as calculated by the Assembly, and on the property value of each individual property, as assessed by the Land Valuation (Board). These rates-impost can be imported or manually entered (as explained in the previous Chapter 8.7.2.6). Example: The Assembly determines a rate-impost of 0.00123 for all residential class B. Property 678-0789-0012 has property use 102 ('residential class B') and a value of 15,000 GHc. This results in a revenue of 18.45 GHc. - What happens, if no rateable value has been assessed? If in doubt, just choose the default (proposed) option. Alternatively, it is possible for the Finance Section to assess different scenarios with their yield. This is based on a fixed rate for each business class, which is defined by the Assembly for each class in GHc. Example: Hairdresser (can be coded in LUPMIS as 1701) is rated by the Assembly with GHc 50.00 per year. Business 678-0789-0045 has code 1701, i.e. is a hairdresser. The revenue for this business will be 50 GHc. 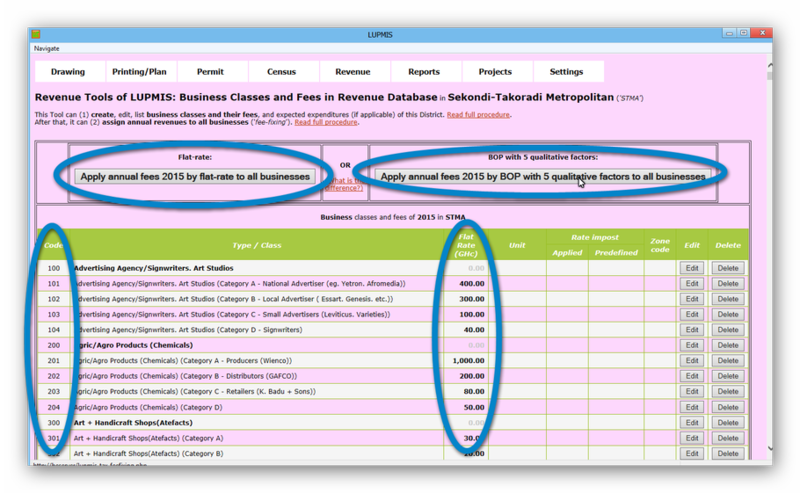 In addition to the same data required for the method above, it also requires the percentage figures for location, number of employees, impact on environment, business office operation, business operations of all business through 'Import revenue data (field)' Tool, as explained in Chapter 8.6.2.2. LUPMIS will automatically add to the base revenue the sum of all 5 factor percentages (sum of all 5 factors / 100, multiplied with the base revenue, added to the base revenue). In the extreme, the base rate of the first method can increase to 6-times. Example: The hairdresser above (LUPMIS code 1701, rated as 50.00 GHc per year) is assessed with 100 for good location, 20 for 1-10 employees, 80 for medium pollution, 40 for agency, 40 for local enterprise. This totals to 280, then divided by 100: 280 / 100 = 2.8, then * 50 = 140. The fee is 50 + 140 = 190 GHc. It is possible to define tax exemption (e.g. for Government institutions). If a unit is tax-exempted, no fees will be calculated, no Demand Notices will be printed. See following Chapter 8.7.2.7a for assignment of tax-exemptions. It is possible to print a map with all tax-exempted properties / businesses. 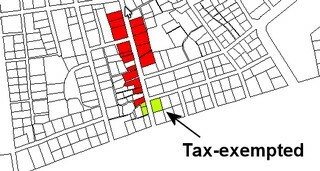 On all 'red/green maps', tax-exempted units appear with a different colour (light green).